While he wrote his "hard novels" in pencil and typed his Maigrets directly, for both of them he used yellow envelopes on which he noted the facts and details for the stories. 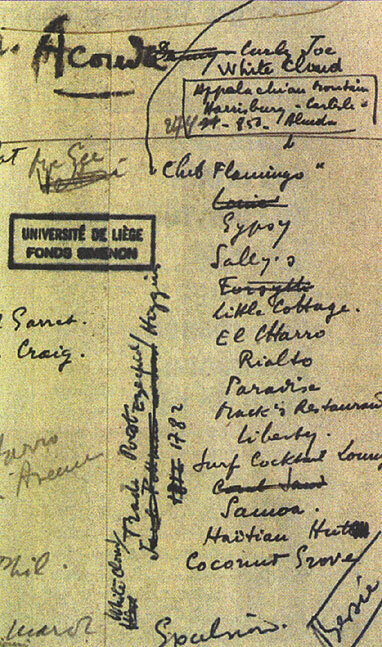 It's in the castle of Colonster, at the heart of the university domain of Sart Tilman in Liege, that Simenon's heritage rests today  documents and objects which evoke the memory of the novelist and his career, and delight his fans and seekers. In the room where actual documents are preserved, we see exposed on the walls the original French and foreign editions. In the display cases and cabinets, we discover manuscripts for a great number of novels and photos which Simenon took during his numerous trips around the world, a collection of critical works, press kits arranged year after year by his office, and a certain number of examples of his works before the great Simenon. We also find in the Collection the famous yellow envelopes, explains Benoît Denis. When he was immersed in the writing of his novels, Simenon noted on these envelopes the names of his characters, their ages and various information so that he could concentrate completely on his writing, and not make some factual mistake. The Collection also preserves copies of films  old and new  based on his works, as well as remarkable objects like the golden ball engraved with his name by Cartier, or his office furnishings (recently given by his heirs). And to think that all of these literary treasures could have wound up in Russia... for before giving them to the University of Liege, in 1976, Simenon was ready to bequeath them to the University of Saint Petersburg, where he knew a professor who had translated his works. He thought that the Communists would take care of his writing, given their "working class" aspect. At the time, I was assistant to Maurice Piron, says Jacques Dubois. He had decided to write to Simenon to let him know that we had, at the end of the '60s, established a year's course on Simenon. We felt that it was not normal that the University of Liege taught Belgian literature without mentioning this great writer from Liege. Simenon responded. Maurice Piron and he met, and Simenon told him how moved he'd been to be the object of a course, and told him of his decision to give, as he put it himself, "everything that a man my age can accumulate.